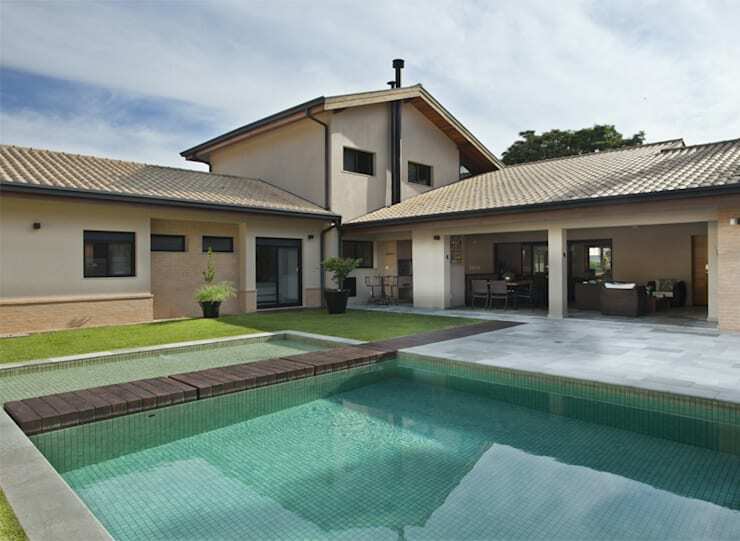 Brazil-based Cria Architects brings us a lovely and rustic suburban home today on homify. 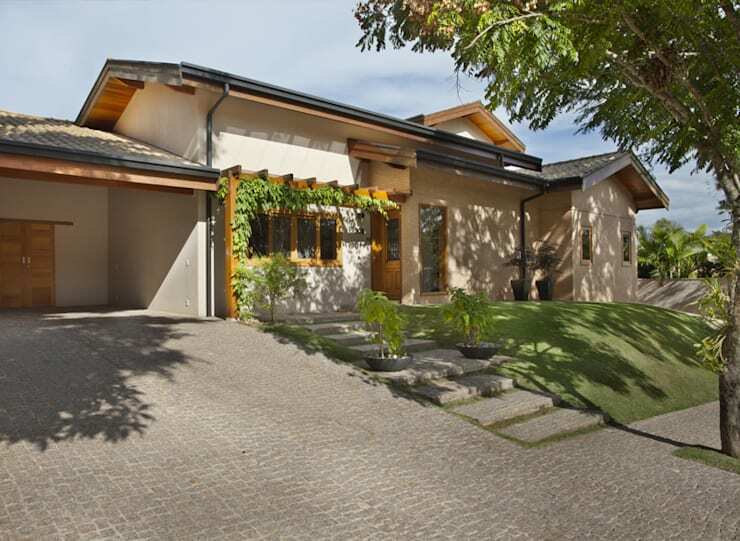 This 410 square metre family home is situated in the Itamaracá Valley in Valinhos. Traditional materials such as brick and wood had been prioritised in the home's construction, in order to gain a particular modern, yet rustic appearance. The most prominent feature of this home is a covered terrace which connects the kitchen, dining room and living room. A whole new entertainment and living area is thus created, allowing equally easy access to both the interior of the house and the swimming pool. All in all, this looks to be a very promising suburban home with ideal family features and a charming appearance. Join us on a tour of this house to see what it has to offer! This beautiful suburban home seems warm and inviting from the get-go. Just look at the earthy colours and soft edges created by the use of wood as building material in conjunction with brick. Standing in the street, we get a good overview of what the home has to offer: generous spaces, eclectic style, and the integration of nature in the design. The wooden veranda covered in vines is certainly a beautiful touch and great first impression! The grey cobblestone driveway leading up to the garage correlates with the grey of the roof and shingles, creating continuity in the design. As we can see, the front side of the house enjoys ample shade, which should aid in temperature control of the front rooms. The kitchen is a room that received much special attention in this project. The architects spent a great deal of time in creating the right layout and choosing suitable materials. The black stone counter tops the overhang the white cabinets significantly create an interesting play between positive and negative space in the room. The flooring was also considered carefully and the result is lovely. 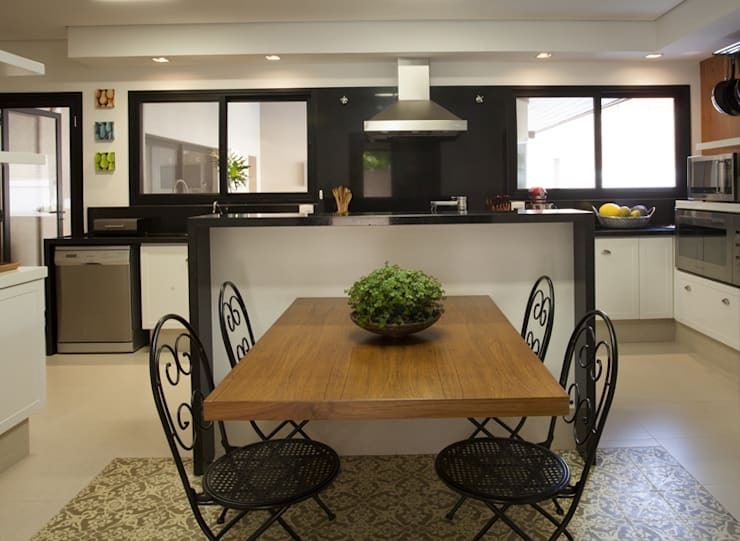 Hydraulic tiles (those on which a patterned pigment is pressed hydraulically to become part of the tile surface) were used to add to the distinct rustic character and pleasingly contrast with the more modern kitchen fixtures. If you were wondering how the furniture in the kitchen suit the space so well, it took much more than looking for a good fit. The architects designed this furniture themselves, specifically for this space. Now, that's when you know you hired the right people for the job—someone who goes out of their way to create the perfect space! What becomes evident is that no space is wasted in this house. Although the rooms seem spacious, open and clean, the architects went to some effort in designing the areas to accommodate storage and continued usefulness. For example, this corner, which could easily have been left as sever long, vertical closets, has rather been opened up, hosting both cabinets and shelves. This ensures that the vertical space is used optimally, as well as promoting a cleaner space where storage isn't hidden behind closed doors to just gather dust. 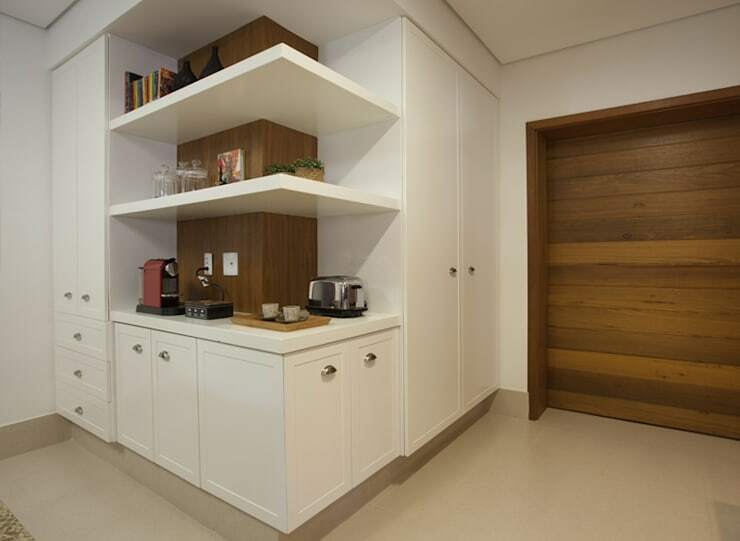 The wooden spine which runs through the series of white cabinets and shelves draws the composition together, and is well suited to the wooden door we can see on the right. The combination of white and wood also results in an elegant and sophisticated overall appearance. 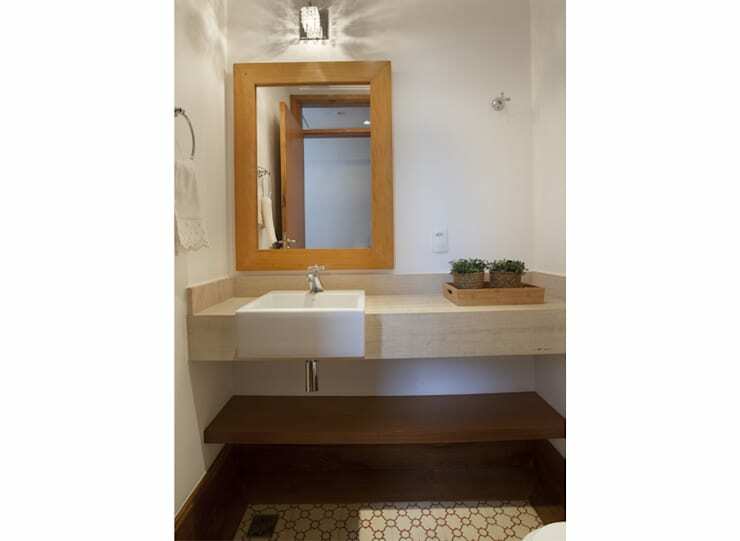 Moving on to the bathroom, we are greeted by a pleasant asymmetry in the design. This creates a visual interest in a small area, which might otherwise feel cramped and claustrophobic. Instead, the play of colours, shapes and light create a comfortable little alcove in which the basin or vanity area of the bathroom is situated. Here we can also see the use of hydraulic tiles, such as those used in the kitchen. This lends a charming character to the room, and also refers back to the overall rustic theme of the house we have seen so clearly expressed in the kitchen. As with the kitchen, though, the bathroom has its modern sides with strong geometric forms. This porch, connected to the TV room, dining room and living room, takes up an impressive area of 60 square metres. This is the favourite spot of the house's owners, including an outdoor gourmet kitchen area, two dining tables, a lounge area, and bar counter. Not to mention a built-in barbecue! Just imagine the wonderful braais you could host here! 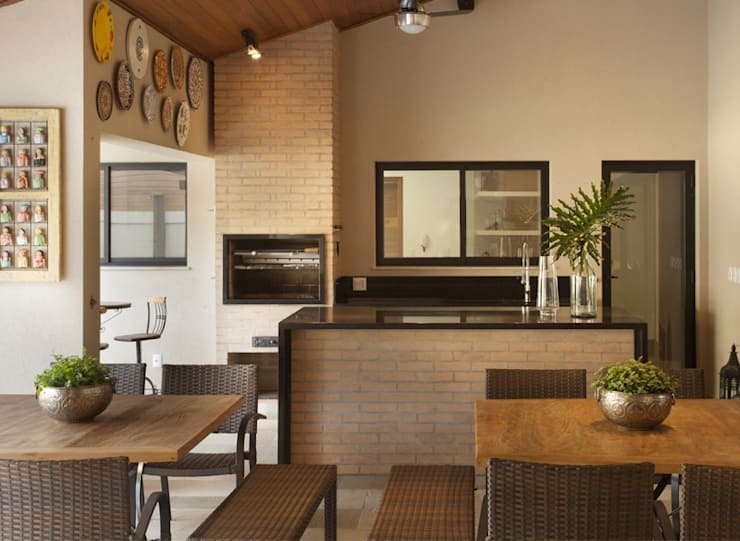 If it looks good to you, why not take a look at: Creating Your Own Braai Terrace? The use of sandy brick, beige plaster, wooden tables and imitation wicker as the main materials gives a very natural and relaxed feel. The sleek black counter tops, on the other hand, adds a touch of the modern. This entire space is open to the swimming pool and the garden, making for excellent views as well as air circulation. It is the ultimate in indoor-outdoor living, which is all the rage right now in architecture and design. Lastly, we get to see the pool and garden area. We also get another vantage point on the exterior of the house, from where we can see the different sections of it fitting snugly into one another. The large and crystal-clear swimming pool is decked out in small, ceramic tiles, giving it the appearance of beauty spas and luxury resorts. The use of white tiles also increases the pool's brightness and makes it easier to navigate for younger family members. From here we can also see that special porch area we investigated in the previous image. As we can see here, it is wide open to the outdoors, making this the perfect home for pool parties and entertainment. Would you enjoy having such a large outdoor entertainment area? Share your thoughts on this home with us in the comments!